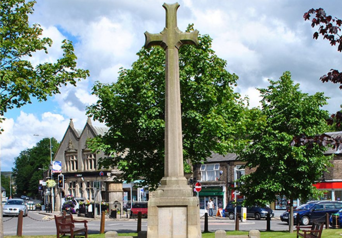 ¨ 100 years ago Furness Vale was situated in four Parishes: Disley, Taxal, New Mills and Glossop – and in two Dioceses: Chester and Southwell! ¨ 1865 – Villagers had long wanted their own church but needed an Endowment to fund its ministry. Only Disley would agree, and due to the patience and generosity of Canon Satterswaite, late Vicar of Disley, and support of the Bishop of Chester and Col. Joddrell, St John’s Mission and School was founded . Permission was given by Mr Saxby to use the barn at Lodge Farm . ¨ 1905 members of the Mission Church began discussions to start the building of a church and a Building Fund was set up. ¨ 1908 – a public meeting was called to agree the building of a ‘tin tabernacle’ but villagers wanted a ‘good stone Church’ . Col. Joddrell provided the site, donating £500. ¨ 1910 Mr Preston’s plans were approved and the contract awarded to Mr J W Swindells, though the architect’s plan for a tower was never realised. ¨ 1912 – Gladys McCartney was the first child to be baptised. She later attended GFS and became a Sunday School Teacher. Gladys died 4th March 2008 aged 96yrs. Her funeral service was held in St John’s. ¨ From the earliest days St John’s Sunday School flourished and the Rose Fete was held every year in June. A Rose Queen and sometimes a Rose Bud was chosen to represent the young people of the church. A procession was held from Newtown to Bridgemont returning to St John’s for a Garden Party and the Crowning Ceremony. 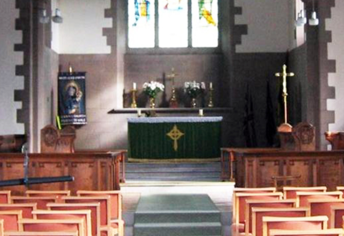 ¨ 1989, August 26th– The first Wedding took place at St John’s Church. Alan Jones and Jane Holyoake were married by the Revd Dr Simon Cox. ¨ 1991 – The Church and Hall were re-decorated by volunteers from the Congregation and the Organ was restored. 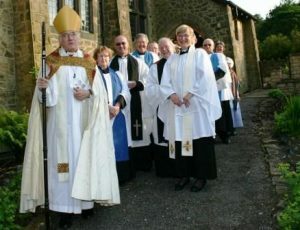 Most of the congregation took part in a ‘Talent Scheme’ to pay for the restoration. ¨ 1995 – A stained glass window in the Baptistry depicting the Baptism of Jesus was dedicated to the memory of Margaret Jean Farrow, a Girls Friendly Society (GFS) leader for many years. The window, given by the family, bears the GFS Motto. An earlier window depicting a WW1 soldier was vandalised and broken beyond repair. 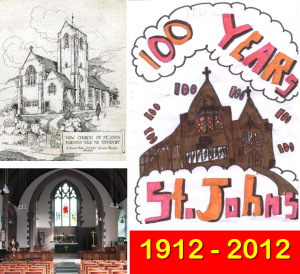 ¨ 2002 – The last service was held at the Methodist Chapel in July and for a while afterwards Methodist services were held at St John’s. The Village Christmas Eve Carol Service , for many years held at the chapel, has been at St John’s ever since.